I am from India, a country with a rich and varied cuisine where baking is not a traditional method of cooking. However, in certain parts of India, some form of baking has become a custom over the years as a result of trade with other countries or foreign invasions. The naans (Indian flatbreads) and other tandoori breads of northern India came in from Persia while bakes like cakes, puddings and biscuits (as we call our cookies) are the legacy of the British, French, Dutch or Portuguese occupation of India. I enjoy baking and though we eat eggs, we are not fond of them. Over the years, I have tried adapting baking recipes requiring eggs by either reducing the eggs to the bare minimum, or not using them. I do bake with eggs some of the time, where they cannot be avoided and make a difference in my recipe. Here, I’m sharing my experience about egg substitutes that have worked in my baking. Eggs are such a large part of baking, that it is challenging to substitute or replace them. This was particularly true with most Daring Baker challenges. I have been successful with some of them while I failed miserably with others, and I’m still learning. Some bakes, like angel food cakes, chiffon cakes, soufflés and meringues, are highly dependent on a large number of beaten eggs/ whites for lightness and volume they provide. It is almost impossible to substitute for eggs in these recipes. The easiest way to bake without eggs is to use vegan recipes. Even if you are not vegan but want to avoid eggs, you can adapt many vegan recipes to suit your taste. However, I have found some vegan recipes excellent while others have been a disappointment. So I have, over time, got used to baking by adapting regular recipes which use eggs. Substituting for eggs in baking is not difficult most of the time, provided one keeps three things in mind. Understand the exact nature of the function the egg is performing in your recipe of choice. Then substitution becomes easier. Sometimes, you may have to use one or more substitutes together to mimic the action of eggs in your bakes. How does one figure out which function the egg in your recipe, is responsible for? If egg is the main liquid in the recipe, it is adding to the moisture. Eggs can also add richness to the bake. If the recipe is asking for just one egg, a reasonable amount of baking powder/ and baking soda but no other binding agent like flour or breadcrumbs, then the egg is acting as a binder. Here, it is necessary to use a substitute which would mimic this property. If there are little or no other leavening agents in the recipe, the egg is the leavening agent and provides a light and airy texture. In many such recipes, the egg can be replaced with a substitute that also involves baking powder. Know that it is easiest to substitute for 1 (or at the most 2 eggs) egg in a recipe and this substitution will give you the best possible results for an eggless bake. It is very difficult, if not impossible, to substitute for 6 eggs! In this case, the best option would be to substitute for about half the eggs in the recipe. If you do not eat eggs at all, then look for an eggless recipe rather than try to adapt one which uses eggs. Remember that the eggs are in the recipe for a particular purpose. If they are substituted for, do not expect the same texture and taste as the original. That’s not to say your eggless bake will not be good, just that it will be slightly different from the original. Having said that, I have to admit that I have been disappointed with some bakes where I have substituted for eggs. One egg substitute which most people reach for is commercial egg replacer powders like Ener-G which, I understand, is a reasonably good all-round replacement in most recipes as it works as a leavening agent as well as a binder. I live in Goa where baking is a part of culinary tradition due to Portuguese influence, so the concept of eggless baking is a bit redundant and an Ener-G type of egg replacer is the last thing I can expect to find on the store shelves here. So I tend to use other commonly available egg substitutes in my bakes. I’m listing as many substitutes as I know of, where they can be substituted (in amounts equal to 1 egg), and what kind of bakes these usually work well in. I just mentioned this above and they’re to be used according to the instructions on the package. I believe 1 1/2 teaspoons of Ener-G + 2 tablespoons of water substitutes for 1 egg. 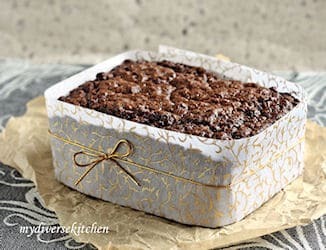 This is supposed to be good in most bakes, especially cookies, breads and cakes. A lot of the time, if you want to substitute for only one egg in a recipe where it is a leavening agent, increasing the baking powder by about a little over 1/2 teaspoon will suffice. Too much baking powder will lend a bitter taste. Incorporating air into the batter by creaming the sugar and butter, as well as whipping together the liquid ingredients (where the recipe allows this, as in muffins) also helps lighten the bake. In these Chocolate Chip Covered Vanilla Cupcakes, I left out the eggs and increased the milk a bit. The creaming process and baking powder make the cupcakes light and airy and these are my most popular cupcakes to date. Powder as fine as possible (will be a bit coarse), about 1/2 a cup of flaxseeds at a time, and store this in an airtight container in the refrigerator. Mix 1 tablespoon of this powder with 3 tablespoon of warm water and whisk well. Let it stand for a few minutes till it becomes viscous. Whisk well before using in recipe. Powdered flaxseed lends a “nutty” flavour and is good in cookies (especially oatmeal), muffins, brownies, pancakes and waffles. You can replace up to 2 eggs though it’s best for 1 egg. Any more means the taste of flaxseed comes through. I have found my cookies becoming “gummier” in texture when replacing 2 or more eggs with flaxseed powder. Unsweetened applesauce can be used in recipes where eggs increase the moisture in bakes. Substitute 1/4 cup of it for 1 egg. Applesauce works well in moist bakes like certain cakes, brownies, muffins and quick breads. Also use baking powder or baking soda for some leavening or this substitution might not work very well because fruit makes bakes dense. However, applesauce can lend an “apple” flavour which might not be desirable in certain bakes. My Healthy Low Fat Brownies use applesauce with no apple flavour. Puréed beets not only give my Red Velvet Cakes their glorious red colour but with baking powder made them light and moist. 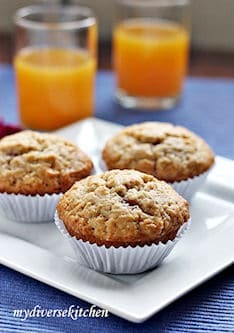 I use fresh mango purée, yogurt and powdered flax seed instead of eggs in my Mango Ginger Muffins. Like applesauce, ripe bananas also add moisture to bakes. They also act as binders so they’re a very good substitute for eggs. On the flip side, your bake will taste of bananas. Again, ensure the recipe uses baking powder for leavening to avoid a dense bake. 1/2 a ripe banana, mashed or puréed, can replace 1 egg. This works well in muffins and quick breads, some cakes, yeasted banana bread and pancakes. Banana also helps in browning in bakes. 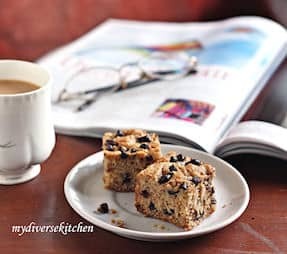 These Chocolate Chip And Banana Squares are an all time favourite. Tofu is quite flavourless, and excellent at taking on other flavours. Silken tofu has the creamiest texture and is an excellent egg substitute in puddings, mousse and cheesecake. I have used firm/ regular tofu successfully but silken tofu does produce a much better texture. I have found that cream cheese/ paneer (fresh Indian milk cheese) works well in cheesecakes instead of eggs. Run 1/4 cup crumbled tofu in the blender or food processor till very smooth and creamy and use in place of 1 egg. The wet ingredients in the recipe can be added to the tofu while blending, for best results. Tofu makes bakes a bit dense so it is best in moist cakes, brownies, pie fillings and quiche. In recipes where eggs are used to make a custard type filling or as a binder as in cookies, tofu would have to be used with a binder like cornstarch. In India (and some other countries including the UK and Australia), we get something called custard powder in our stores, which is somewhat like a vanilla pudding mix. Custard powder is made from cornstarch to which organic colouring and flavours have been added. This is good to make custard without eggs. 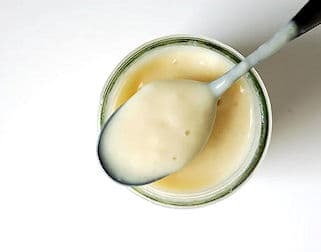 Custard powder is cooked with milk and sugar till thick and can be used to make creamy sauces, thick set fillings for tarts and caramel custard. Use this according to instructions on the packet. If you cannot find custard powder, cornstarch and flavouring agent of your choice will also work just as well. 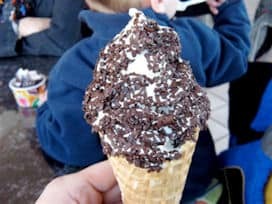 Making ice-creams is not baking, but I thought I would mention that cornstarch is (sometimes custard powder) an excellent substitute for eggs in home-made ice-creams. Be careful how much of it you use, or else the taste of cornstarch/ custard powder will come through. A combination of vinegar and baking soda mimics the leavening ability of egg. Many people also add a bit of oil as well. Baking soda reacts with the acid in vinegar to bubble up and introduce air, making bakes fluffy. 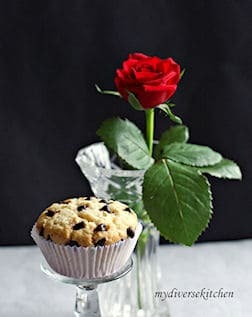 1 teaspoon baking soda + 1 tablespoon white or apple cider vinegar can replace 1 egg in quick breads, cupcakes and cakes. This substitution is good for 1 egg as sometimes replacing 2 eggs with this can result in some gumminess. 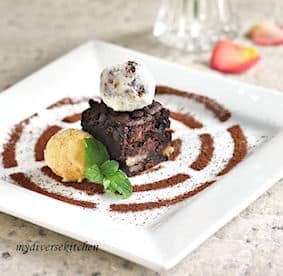 My Orange And Chocolate Zebras Cake, Snowflake Cookies and Spiced Avocado Cake Pictured at top of article are baked using baking soda with vinegar/ buttermilk. Where egg adds moisture to a bake, 1/4 cup yogurt can be substituted for every egg. This is good in some cakes, bars, muffins and quick breads. Yogurt would need to be used with baking powder to avoid a dense/ gummy bake. My Chocolate Zucchini Bread and Carrot Cake With Chocolate Ganache both use yogurt with a combination of other substitutes for eggs. Agar is a seaweed extract that has properties similar to gelatin. Agar is a good substitute in recipes requiring 1 or 2 egg whites (not for meringues and similar recipes). Dissolve 1 tablespoon agar powder in 1 tablespoon warm water to substitute for 1 egg. Whisk well, and then chill. Whisk again and use. Egg wash is beaten egg which is brushed on breads or pastry before baking to obtain browning and a shine. The same effect can be achieved with milk, oil or butter. I never use egg wash on my breads and rolls. Milk works very well for me. Day old bread slices/ breadcrumbs and/ or chickpea flour where eggs act as binders. 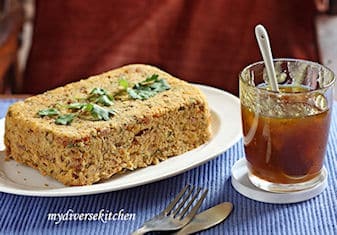 This is something I use in recipes like patties, cutlets, and this Vegetable And Lentil Loaf I made recently. 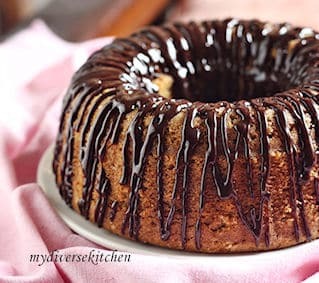 Sometimes, condensed milk (along with baking powder) can work well in some cakes like this one. 1/4 cup puréed prunes. I have used puréed strawberries (with baking powder) to make a pretty good Fresh Strawberry Cake. If you have wondered about baking without eggs, you can see that it isn’t impossible. I find that it just needs a bit of thought (alright, a lot of it! ), and the willingness to explore various alternatives. I would be happy to hear from any of you, about your tried and tested egg substitutes for bakes.